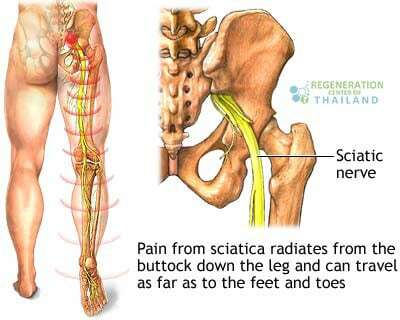 Sciatic nerve damage is not a permanent condition and can be reversed effectively at the regeneration center of Thailand. The effects of peripheral neuropathy, Pinched Nerves & Sciatica can be damaging if left untreated. Conditions that can lead to this injury are mostly related to the spine which is primarily responsible for your movement and function. Others first show symptoms after a serious shoulder injury or damage to the hip joints and knees. Imagine having to live a life with sciatic nerve injury and predisposing yourself to several distressing symptoms such as severe pain and muscle weakness, loss of mobility and sensation, and even loss of bowel or bladder control. In effect, your general quality of living would be greatly affected if sciatica is not properly addressed and treated effectively using MSC+ stem cells. It is for this reason that treatment should be applied at the very onset of symptoms. Sciatica, or sciatic nerve impingement, can lead to permanent nerve damage due to either severe injuries or a prolonged and untreated case. Stem cells are basically our bodies master cells that can assume the role of basically any cell in the human body. Stem cell therapy process requires the use of adult stem cells, which greatly differ from embryonic cells. The use of adult stem cells eradicates the argument that surrounds the issues regarding the research on embryonic stem cells. The adult cells used for the treatment of chronic pain are referred to as the mesenchymal cells. These, in turn, can embrace the cell characteristic and assume the part, be it cartilage, bone, fat “adipose” cells, or nerve cells. These mesenchymal cells may be harvested from the patient’s fat deposits or adipose tissue around the abdomen, or his/her bone marrow (usually from the hip). The harvested cells are then introduced into the site of injury for them to eventually grow and rejuvenate the injured area. If the patient has poor health and is not a candidate for autologous cell therapy we can offer immune compatible cells from cord tissue or placenta derived cells. If you are interested in relieving Sciatica without the risks of having back Surgery or Steroid injections then a combination of PRP + Expanded 2nd generation MSc+ Stemcell may be a good alternative. Our research experience has shown that most people with sciatica prefer not to have surgery or risk the long term side effects experienced with frequent steroid injections. The regeneration center offers an innovative and very effective alternative that actually treats the underlying condition that is causing the pain. 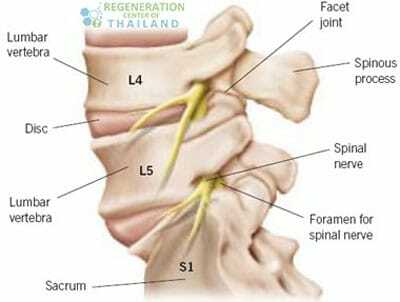 Our advanced sciatica protocol uses PRP (platelet rich plasma) (PRP), neural progenitor cells, nerve and tissue growth factors with laboratory expanded stem cells for powerful results in a multi-stage treatment plan that will require a MINIMUM of 14-16 nights in Bangkok Thailand. The costs for treating sciatic nerve injuries will depend on the extent of the damage to the patients spine or nerves. To qualify for treatment and to receive a complimentary treatment plan with fixed prices for the entire treatment our doctors will need to conduct a virtual consultation using your recent lab results (MRI’s,CT Scans) or medical report from your primary care physician or orthopedic/spinal doctors in your home country. Upon approval, a detailed treatment plan will be provided that will includes the specifics such as exact total number nights required along with the total medical related costs. To begin the qualification process for our multi-stage relief treatment for pinched nerves & Sciatica please prepare your recent medical records contact us today. If I have a mild nerve impingement l4 l5 disc herniation. Can i recieve a stem cell injection into my disc? I had sciatic nerve palsy during my Left Total Hip Replacement Surgery on dtd 24-12-2015resulted in to " FOOTDROP ".March 14,2017 3T MRIof left hip with CT cut indicates" There is thickening of the left sciatic nerve as it traverses the posterior aspects of the acetabulum, with discrete 0.9×2.3×1.9 cm(AP by transverse by craniocaudal ) nodule formation along the nerve as it traverses the posterior aspects of the femoroacetabular joint. "I want regeneration of sciatic nerve if possible so it is requested to give opinion from you regarding results in these conditions of the sciatic nerve. Thank you respected sir. I have Bell's Palsy (iinflamation/injury of the facial nerve) and would like to know available treatment options with stem cells.